The windswept aspect of this design really gives this particular arrangement a unique feel. 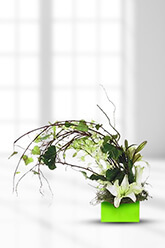 Twisting and turning, this piece really incorporates art using a floral canvas.Lilies may be sent closed/partially closed in order to prevent damage and to last longer.Add to the excitement of receiving a flower gift by adding a large, 45 cm Helium Balloon to your flower arrangement order. It will elaborate the gift and outlast the flowers, doubly extending the feeling of being spoilt. excellent, very easy to order, prompt delivery. My recipient received it with a hyge smile and smiled widely throughout the whole day! My mother loved the flowers! The arrangement was as good as the picture on the site and the flowers are fresh. The flowers were also delivered on time! Thanks!